LG-what? This impressive case report taken from Steven Waxman’s Molecular Neurology illustrates a family with lateral temporal lobe epilepsy (LTLE), a rare form of seizure disorder in which auditory features often precede a generalized tonic-clonic seizure. Auditory or acoustic features including radio sounds, machine noises or more complex acoustic phenomena arise from the lateral temporal lobe, a part of the brain important for auditory processing. During a discussion with one of our students last week, I realised that even though we frequently write about microdeletions and novel gene findings on the EuroEPINOMICS blog, some of the classics of epilepsy genetics may sometimes be revisited as well. LTLE is the premier example that genetic epilepsies are not neccesarily due to ion channels. From lateral temporal lobe epilepsy to LGI1. Even though lateral as opposed to mesial temporal lobe epilepsy is rare, this seizure disorder has been in the focus of genetic research for at least two reasons. First, a mouse model of spontaneous auditory-induced seizures, the Frings mouse, has been the subject of intense research since the late 50’s and mutations in the MASS1 gene were identified in these animals in 2001. Secondly, some patients with LTLE had a strong family history for the same disease and linkage studies in these families first led to a linkage finding on chromosome 10q24 in 1995, followed by the gene discovery in 2002. This gene turned out to be LGI1. Mutations were found to account for a sizeable proportion of LTLE families and some non-familial cases, but do not seem to play a role in other epilepsies. Given the clinical features of the families with LGI1 mutations, acronyms such as ADPEAF (autosomal dominant partial epilepsy with auditory features) or ADLTE (autosomal dominant lateral temporal lobe epilepsy) are used. LGI1 and ADAM22. After the initial gene discovery, the function of LGI1 protein remained unknown for quite some time, as it does not share common features with known epilepsy genes. LGI1 has been a known protein in cancer research and was named after its alleged role in brain cancer, namely leucine-rich, glioma inactivated 1 protein. After its discovery in ADPEAF, attempts were made to rename LGI1 to epitempin 1, but this initiative eventually lost steam and the name LGI1 is mainly used today. 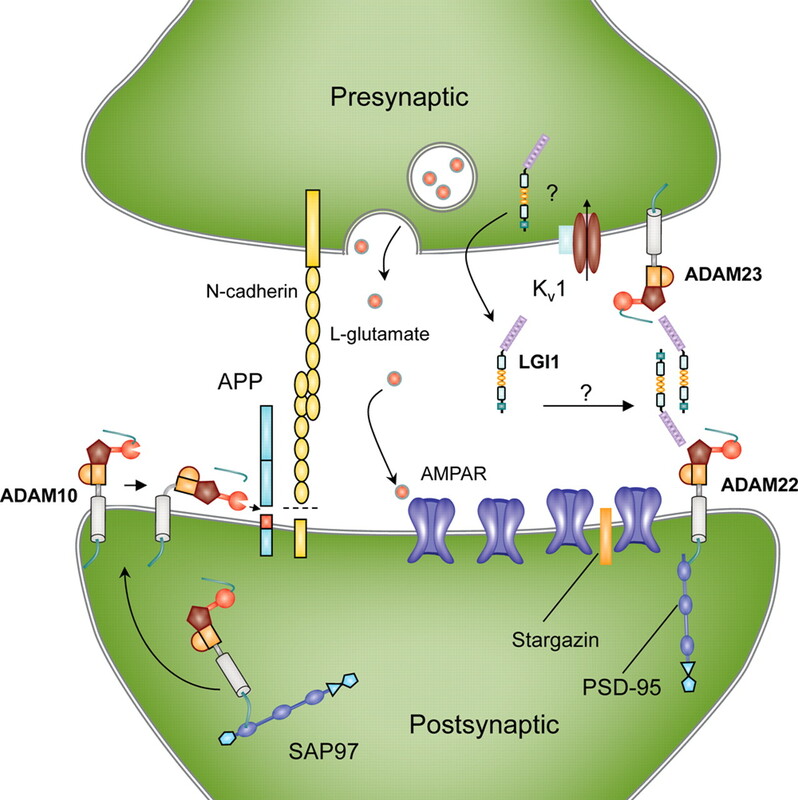 LGI1 is a secreted protein of the presynapse and in 2006, Fukata and collaborators showed that the secreted LGI1 protein interacts with ADAM22 to regulated synaptic function. In brief, secretion of LGI1 lead to inhibition of src-Kinase in the postsynapse. This inhibition, in turn leads to a reduction of postsynaptic excitability through modification of NMDA-receptor subunits. If LGI1 is non-functional, the postsynaptic function remains hyperexcitable and virtually stuck in childhood with different synaptic properties and immature synapses. Interesting, epilepsy genes such as stargazin (CACNG2) are involved in the same postsynaptic pathway. 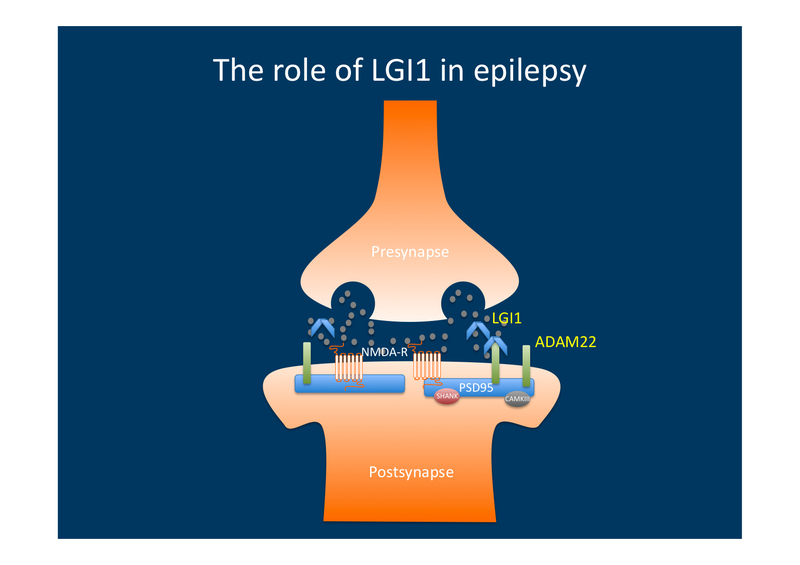 Why mutations in LGI1 result in a focal epilepsy syndrome. Mutations in LGI1 are germline mutations rather than somatic mutations. However, they result in a seizure disorder that is localized to a very specific part of the human cortex. Why this cortex is particularly prone to LGI1-mediated hyperexcitability is still unknown, but other examples of the strikingly localised effect of epilepsy-related mutations are known. For example, mutations in SRPX2 result in epilepsies arising from the rolandic region and mutations in LGI2 cause a benign focal epilepsy syndrome in Lagotto Romagnolo dogs. Identifying genes underlying benign focal epilepsies and trying to understand how gene mutations result in human epilepsies is one part of the EuroEPINOMICS CoGIE project. This entry was posted in 2012, Familial epilepsies and tagged LGI1, SRPX2, synaptic function, Temporal Lobe Epilepsy, tonic clonic seizure. Bookmark the permalink.